The easiest thing to say about Quentin Tarantino's latest film Django Unchained is that it's just so much damn fun and it knows it. Starring Jamie Foxx as the titular slave turned bounty hunter in 1958's American South, the film is a wildly bombastic, violent, hilarious riff on the spaghetti western and blaxploitation genres with Tarantino's trademark stylistic genre twists. 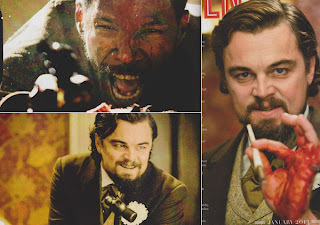 Despite all the fun, Django Unchained easily feels like Tarantino's messiest, most bloated fare yet. Clocking in at 165 minutes, it's basically three different films combined. This is Tarantino's first film not edited by the late Sally Menke (Tarantino's closest collaborator) and you feel its lack of discipline in construction and pacing in the third act. It's not nearly as tight or sharp as all his other pictures. This is to stay, it still features some very strong cinematic storytelling. One of the most memorable scenes involves forerunners to the Ku Klux Klan and has almost no place in the film. However, it is wildly hilarious and one of the most entertaining scenes on film of the year. Much of the film feels this way as a collection of loosely connected scenes of amusing drama and comedy. 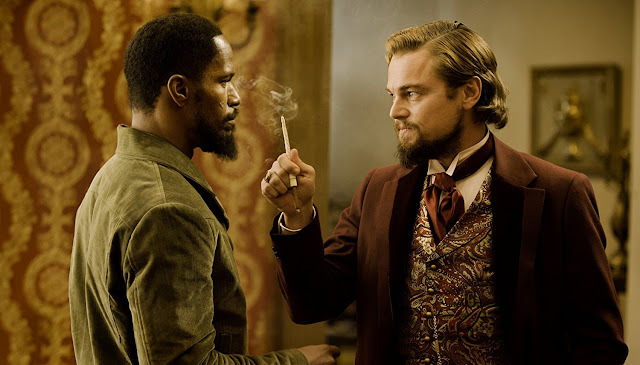 Django Unchained bursts at the seams with explicit language and content. With countless N-words and bodies blowing up like balloons, Tarantino further embraces his flair for brutal, cartoonish, bloody violence. It's uncomfortable and hard to watch, playing on white guilt and our feelings about slavery. 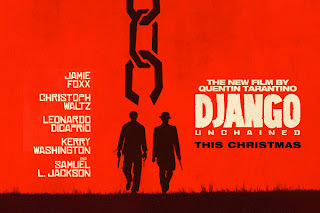 Foxx is able and the right kind of cool as the unflappable Django. He plays it quiet, slowly building in confidence and flair. His natural charm and understated humour fits well into Tarantino's world. The remarkable Christoph Waltz is delightfully watchable and earnest as an offbeat German dentist turned bounty hunter, who kills for a living yet is disgusted by slavery. Leonardo DiCaprio and Samuel L. Jackson steal the picture as a deliciously devilish slave owning plantation heir and his duplicitously loyal Uncle Tom of a servant. DiCaprio gleefully revels in his villainy with a contagious enthusiasm. Jackson is utterly hilarious and frightening, basking in betraying his own race and antagonizing our heroes. Django Unchained specializes in wildly violent, brutal entertainment, executed with a brazen irresponsibility and simultaneous ethical seriousness. This is all to firmly establish its part in Tarantino's filmic version of the historical world. Despite its messy narrative and bloody content, it has a lot to say about America's past and present. It's done stylishly with humour and great theatrics.